A foyer table is the ideal piece of accent furniture to make your home feel welcoming and complete. Instead of having an empty entryway, you can place a foyer table in your front hallway for visual interest. This type of table is not only attractive, but also functional, and some varieties even offer storage space. When people walk into your home, you want to impress them. A foyer table will make your entryway appear more attractive, pulled together, and aesthetically pleasing. Plus, it will provide much-needed surface space for decorative items, knick-knacks, photographs, keys, and more. Here, we’ll review the main types of entryway tables so that you can select the perfect one to round out your home and accent your foyer. A console table is a popular option of foyer table. The typical design of this variety of table is space-saving, convenient, and appropriate for virtually any entryway. Plus, console tables often feature striking designs and visual elements to add pizazz to your entryway. A console table is a table that’s supported by two or four legs and is placed against a wall. Some console tables must be mounted against a wall in order to stay upright and supported. However, designs that must be attached to the wall with brackets are less common on the market today and often viewed as a thing of the past. Nowadays, most console tables stand on their own. Console tables are an especially fitting choice if your home’s entryway is in the shape of a confined hallway. Due to their narrow design, console tables maximize space in your foyer to allow plenty of room for walking, standing, and socializing. Plus, with the beautiful design elements often included in the structure of a console table, it will be an attractive piece of furniture to enhance the overall look of your entryway. Console tables feature a flat-topped surface and some type of supportive structure, whether it be legs or a pedestal-style base. Due to the fact that console tables are always placed up against a wall, this type of furniture is perfectly suited to hallways and foyers. Many console tables have quite simple designs while others feature shelving, drawers, and decorative accents. As such, the price of different console tables ranges widely. But, there are plenty of budget-friendly console tables that still deliver on functionality and style. Console tables have a space-saving design for a feeling of openness in your foyer. This variety of table often has a simplistic structure and is therefore highly affordable. The simplistic structure is adaptable and can be used in just about any room in your home, not just the foyer. The style of a console table is an important element to consider while furniture shopping; you should make sure that the table you select coordinates with the rest of your home. You can seek out a table to match the existing decor in your foyer for continuity. Or, if your foyer is neutral, consider finding a wholly unique table to stand on its own and act as a centerpiece. This modern and minimalist console table is a fantastic choice for small entryways. It’s quite narrow while still providing ample storage space with an upper and lower shelf. Additionally, the dark gray color of this console table will nicely accompany a variety of home decor. The Stoneford Console Table is simplistic, attractive, and affordable. Two shelves offer enough surface space to hold books, plants, and knick-knacks. Plus, the sleek black color will coordinate easily with many different entryway designs. This console table provides an elegant, sophisticated touch to any entryway. It features a dark wood finish and is supported with an open design leading down to the base. The top surface is long and narrow to hold an assortment of decorative or household objects. A round foyer table is a fantastic option for homeowners with wide entryways. Although round tables aren’t as space-efficient as other available options, they provide an elegant look and plenty of surface space. What Defines a Round Foyer Table? A round foyer table is a small table with a round surface mainly used for decorative purposes. While you may choose to place small keepsakes and other items on this type of table, such as a vase or photograph, its main purpose is to add to the overall aesthetic of your home’s entryway. The top surface of this type of table is circular and generally supported by four legs. 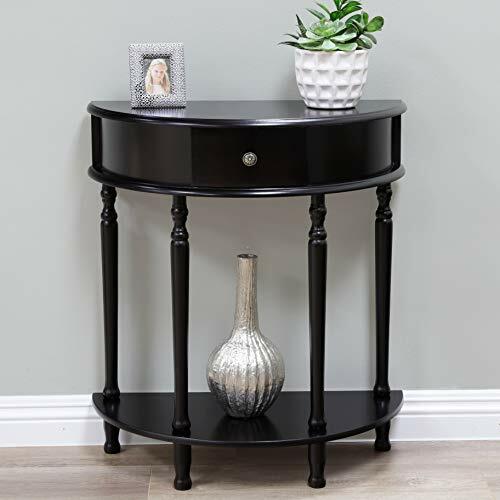 Some round entryway tables have a small shelf built into the legs for added surface space. Round foyer tables are generally intended for decorative purposes. As such, these tables feature eye-catching design elements. A round table can help to bring variety to a rectangular foyer by contributing a circular shape. The rounded shape of a circular foyer table is proven to be aesthetically pleasing; curved lines in architecture and furniture design create a sense of balance and softness. While sharp lines and geometric shapes provide an edgy look, a round foyer table will give your entryway a feeling of calm. Depending on your tastes and style preferences, rounded lines could greatly benefit the overall design of your home. Round tables may feature interesting leg designs with scrolling, leaves, geometric shapes, and more. In addition, some round tables have a small shelf built into the legs to provide extra storage space. The circular surface of this type of table makes it a safe choice for households with children who may get hurt by running into a table with sharp, square edges. 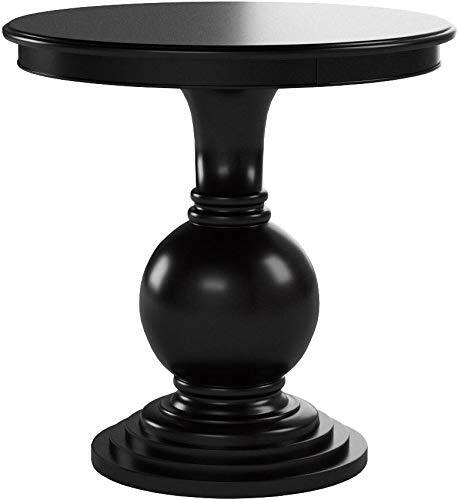 Below you’ll find a list of round entryway tables available today. These tables include attractive designs and functional structures. This round side table in the color espresso has a truly timeless look. The round base offers visual interest while the surface of the table provides room for a small plant, a dish for your keys, a framed photograph, etc. The espresso finish mimics the look of real wood for an upscale, classy design. 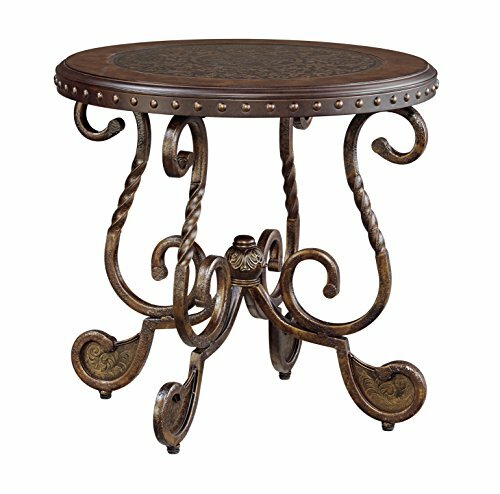 The round Rafferty End Table has a vintage design with decorative metal elements, a hand-applied antiqued finish, and scrolling metal legs. The distinctive look will make your foyer stand out from the rest and is sure to catch the eyes of your guests. The Beckfield End Table features a wood finish, lower shelf, and metal cage design. The structure is interesting and unique while the wood finish provides a classic touch. A half-circle console table is basically a combination of a round foyer table and a console table. This type of table offers the best of both worlds when it comes to design and functionality, making it a common choice among homeowners for use in the foyer. Half-circle console tables have one round side and one flat side. The curved lines of the round side offer a soft, beautiful look, while the straight edge can be placed against a wall to save space. Half-circle console tables come in a variety of different lengths so that you can select the right size for your entryway. Many of this type of console table features a small drawer at the front to store small objects, keys, knick-knacks, etc. The rounded edge is safe for children, as there are no sharp corners facing out into the foyer. Half-circle console tables are supported by two or four legs. Many of this type of table include a small shelf near the base for added storage. The Dory Console Table is an elegant variety of console table with a half-circle shape. It’s narrow to provide as much open space in your foyer as possible, but still long enough to offer surface space for small objects. This table is supported by four long legs and has a lower shelf to hold extra books, keepsakes, etc. Homeowners seeking an elaborate design may love this half-circle console table with golden accents and intricate design elements. The four supportive legs feature scrolling and a lovely leaf design for visual interest, while the top surface is perfect for displaying a vase, candle, or framed photo. The Clifton Console Table has a simple design to coordinate with any home decor. It’s available in three different colors of wood and has a front drawer for convenient storage. Sideboards are generally used to provide additional storage space in any room, whether it be the kitchen, dining room, or home office. However, this variety of furniture also acts as an excellent table for your foyer. A sideboard is a rectangular piece of furniture with short legs or no legs at all. It features a combination of drawers, shelves, cubbies, and hutches to provide storage for all different types of objects. Sideboards are often used in dining rooms to store dishes or even show off fine china. The flat-topped design also lends itself well to laying out food to serve. A small sideboard makes an ideal foyer table because of the combination of storage space and a flat surface to display decorative items. A sideboard is a wonderfully versatile piece of furniture and may be used throughout your home. Placing a sideboard in your front hallway will offer convenient storage space while adding to the overall aesthetic of the area. Sideboards come in a range of different sizes; you can select one to fit the dimensions of your entryway. Many of this type of entryway table is relatively tall to provide additional drawers, shelves, or cubbies for storage. If you have a large entryway and are looking for a way to have more storage space, a sideboard could be your solution. Especially compared to a console table or round foyer table, sideboards provide a substantial amount of room to hold keepsakes and household objects. Plus, having these items stored in the foyer will keep them readily available whenever you need them. A sideboard can double as storage for shoes to make your entryway less cluttered and more organized. Especially if you have a large family or often host guests, having a place to neatly put away pairs of shoes will keep the foyer as good-looking as possible. Sideboard vs. Credenza: What’s the Difference? Sideboards were created in England, while the credenza originated in 14th century England. Sideboards typically have very short legs or no legs at all; credenzas have slightly longer legs. Credenzas often feature sliding doors, while sideboards can offer hutches for added storage space. This sideboard features planks of wood with different finishes for an entirely unique design. The large cabinets and drawers are ideal for storing anything from books to CDs to photographs. Plus, it has a long surface so that you can display decorative objects to spruce up your foyer. The Alkmene Sideboard stands out from other available options with the intricate fretwork design and mirrors on the doors. When opened, the doors display bright pink shelving with ample space for objects like books or even shoes. This sideboard is on the larger side, so it would be a good choice for sizable foyers. This sideboard has an understated design with a wonderful combination of drawers and shelving to maximize storage space in your foyer. The rustic wood design of the front of this sideboard is complemented by the gray concrete finish of the top surface.